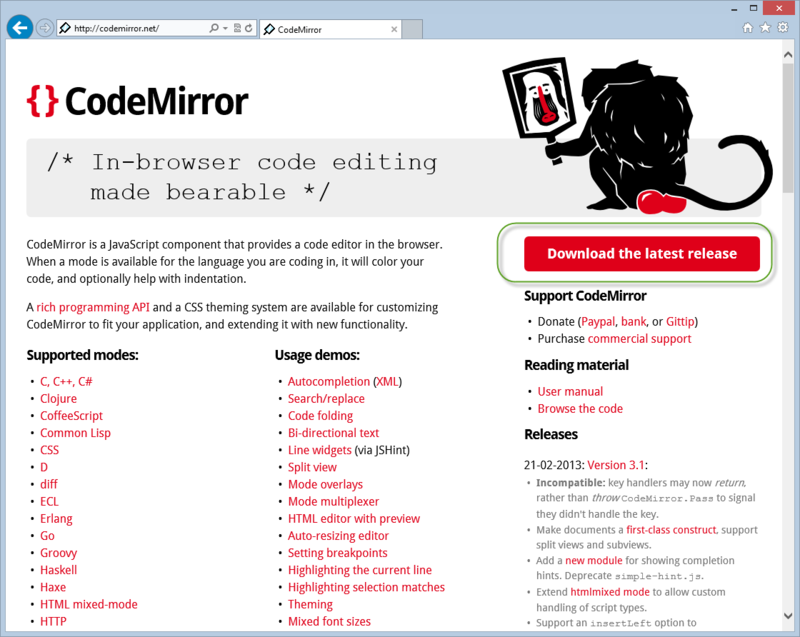 Improve the template editing experience with CodeMirror. Let's start with the template parsers. To make implementing parsers as easy as possible, we will define a parser base class that will provide a default implementation of the Id and DisplayText properties. The SimpleTextParserEngine will implement a simple text replacing mechanism. Strings surrounded with square brackets will be replaced with a value that we receive via the ViewBag property. So, if the ViewBag is of type IDictionary<string, string> and contains a key "CustomerName", any occurrence of [CustomerName] in the template will be replaced with the value from the ViewBag. // If we have a view bag and it is a dictionary of strings, proces the template by replacing each [key] with the value from the view bag dictionary. Essentially we are checking if the specified template has a Layout specified. If it has one, we replace its "layout beacon" value with the contents of the specified layout. After that, we will simply iterate over the ViewBag property (if specified and if it's a dictionary of strings). In this example, we are leveraging Linq's Aggregate method instead of writing a foreach loop ourselves. The SimpleTextParserEngine is here primarily for demo purposes. 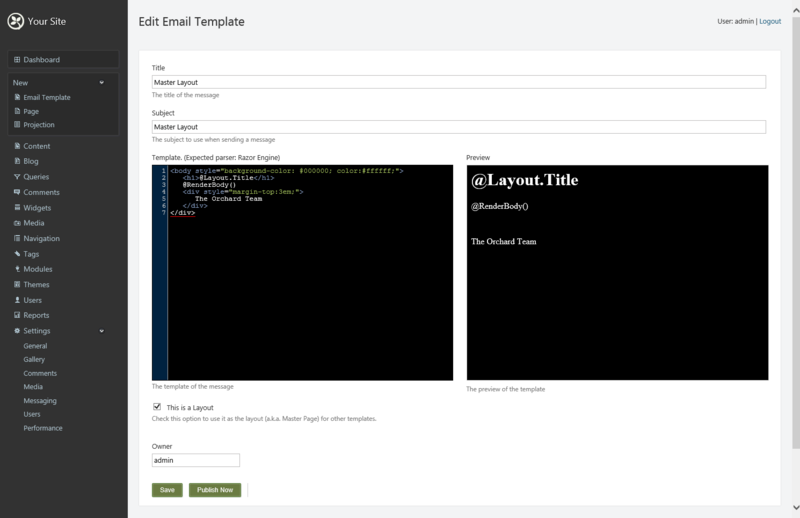 What would be really interesting is if we could create our email templates with Razor syntax (or Smarty Tags or any templating engine that you prefer). There are a couple of approaches that we can take. One approach would be to use Orchard's Shape mechanism to process Razor views. Another approach would be to talk to the Razor engine directly without relying on System.Web classes. I chose the latter. I found two libraries that wrap the Razor engine: https://github.com/Antaris/RazorEngine and https://github.com/jlamfers/RazorMachine. I used to use RazorEngine, but found that it did not yet support Razor 2, and there were some issues when using Layouts. RazorMachine on the other hand already supports Razor 2, implements Layouts and is easy to use. So let's go with that. The first thing we will want to do is create a RazorMachine wrapper class and give it a lifetime scope of Singleton. The reason for this is that initializing the Razor engine is expensive in terms of initialization time. Alternatively we could leverage the Cache to hold a single instance of RazorMachine, but that's up to you. Once you have downloaded the RazorMachine binaries (just a single Xipton.Razor.dll file), copy it to a new folder in your module called Libs/RazorMachine and add a reference to that DLL. 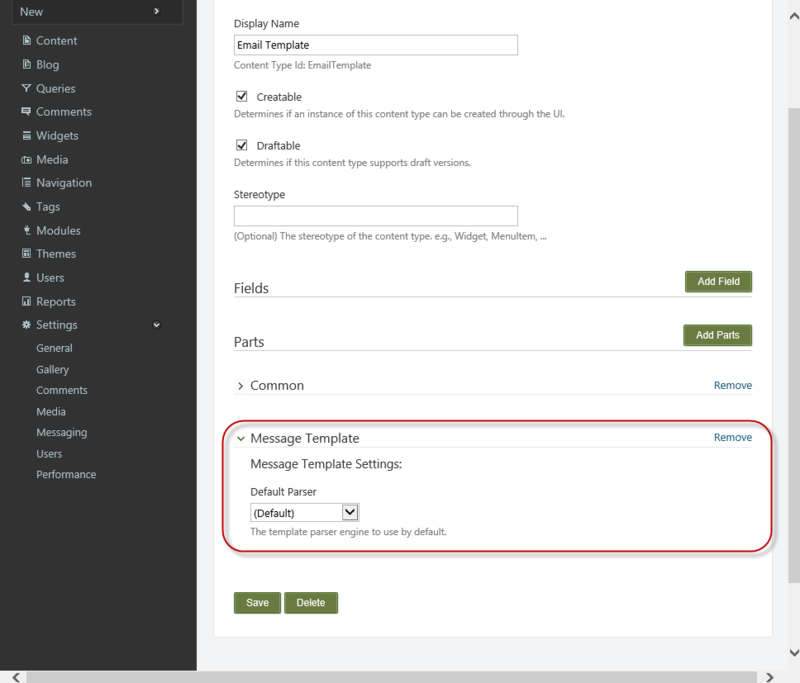 Description: Message Template Management features. Description: Implements Razor as the parser engine for message templates. When you compile the code now, you'll get a compilation error stating that you need to add a referece to System.Web.Razor. You will find this assembly in the lib folder that comes with the Orchard Source package. Notice that the interface derives from ISingleton. As mentioned, this will cause the lifetime scope of an instance of IRazorMachine to be that of a singleton. The class is a simple wrapper around the Xipton.Razor.RazorMachine class. Notice that we decorated the class with the new feature we introduced: "Skywalker.Messaging.Parser.Razor". // Convert viewBag to string/object pairs if required, because that's what Razor expects for a ViewBag. Pretty straightforward. We're injecting an IRazorMachine, use it to register a Layout (if the specified template is setup with one), convert the view bag to a dictionary of objects (since that's the required type for a ViewBag in Razor views), execute the template, and returning the resulting string. Et voila, we have a Razor parser. You may have noticed that we didn't use the LayoutBeacon property here, since the Razor engine itself will know how to deal with that. Couldn't we have done without an explcitly defined LayoutBeacon property at all? Yes we could have, but there's another reason that we need this beacon, which we will see when we implement CodeMirror and the preview pane. Allright, we created two parsers, but which one will be used? Well it depends on what the user wants to use. We could let the user decide which engine to use using just Site Scope Settings, but for this demo we will not only implement Site Scope Settings, but Content Type/Part scope settings as well. Let's start with implementing Site Scope Settings first. Implementing site scope settings requires a couple of steps and there are two approaches: one approach is the "do-it-all-your-self" approach, which requires one more step but also offers more flexibility, and then there's the "do-it-all-your-self-except-for-the-driver" approach. The latter approach is made possible thanks to a content filter called TemplateFilterForRecord. It looks very much like a driver, so you don't have to create a driver yourself. It uses a record as the model instead of a part. Using this method is nice because it saves you from having to write your own driver. However, if you have for example a view model that you want to use, you should implement a driver instead. Which is exactly what we will be doing here. If you're interested in the TemplateFilterForRecord, checkout the Orchard.Users module and its RegistrationSettingsPartHandler. Specify which "group" our settings belong to. When we specify a group, Orchard will render our settings on our own sub menu underneath the "Settings" section. This will be a very simple part, as it will only store one single setting for now: which parser to use by default. We will add a migration step to create a table for the MessagingSiteSettingsRecord class. Normally when you implement a content part, you typically define this part in your migration file as well. In the case of site settings, we don;t have to, as we will be welding on this part dynamically using the ActivatingFilter. 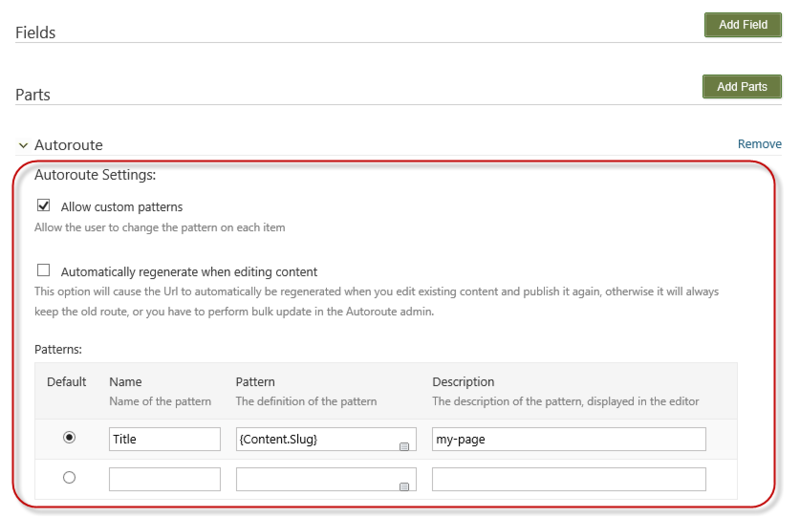 No need for this part to appear in the dashboard nor be attachable nor create a relationship in the database between our part and the Site content type. As mentioned, this step is only required if we don't make use of the TemplateFilterForRecord. In this demo we will create our own driver so we can use a custom view model for our editor template. /// Always implement Prefix to avoid potential model binding naming collisions when another part uses the same property names. // We are in render mode (not postback), so initialize our view model. // Return the EditorTemplate shape, configured with proper values. Notice how we are using the OnGroup method? 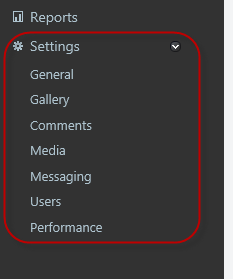 This is key A in order for our settings editor to be rendered underneath a section called "Messaging". We will create a view model for our editor template. Technically, we could have used the content part, but we will making use of the UIHintAttribute again to render a list of available parsers, and since that's more of a UI concern, I prefer to create a view model for it instead of decorating the content part itself with that attribute. But you should feel free to do it differently. We'll see the implementation for the "ParserPicker" template later on. Implementing the OnGetContentItemMetadata method for our content part to return information about which group this part belongs to. This will be key B in order for our settings editor to be rendered underneath a section called "Messaging". Nothing we haven't seen befre here. Let's see how the "ParserPicker" is implemented (which is used in the UIHintAttribute of the view model). We are rendering an ad hoc shape so that we can leverage a IShapeTableProvider class that injects a list of available parsers. We could have done this straight from the template, but doing this from a logically separated layer promotes separation of concerns as well as reusability: if we were to render another ParserPicker shape from someplace else, the same IShapeTableProvider would kick in and inject required data. When invoking the Html.EditorFor helper, it will setup some model metadata that we need when rendering the dropdownlist, such as the name for the field. There we go. What we're doing here is simply fetch a list of Parsers. project them into a list of SelectListItems, which we feed into the DropDownList html helper. But where do the Parsers come from? You guessed it: from an IShapeTableProvider. // Inject a Work of IMessageTemplateService. // the actual list of IShapeTableProviders is stored in an object that implements an interface that derives from ISingleton. // Therefore odds are that when it's time to display the shape, our IMessageTemplateService will be bound to an expired HTTP context. Whenever Orchard is about to render a shape (e.g. because of a call to @Display), it will go through all registered IShapeTableProviders that "describe" the shape about to be rendered. This is where we have a chance to provide additional data to our shape. In our case, we are setting a list of parsers. Notice that we are injecting a Work of IMessageTemplateService instead of a IMessageTemplateService directly. The reason for that is that although IShapeTableProvider itself derives from IDependency, the object that holds the list of IShapeTableProviders (being DefaultShapeTableManager) implements an interface (IShapeTableManager) that derives from ISingleton. That would cause our injected instance of IMessageTeplateService to be bound to an invalid HTTP context scope on subsequent calls, leading to all sorts of nasty errors. The Work<T> class solves this issue nice and clean, because injecting this one will only resolve an IMessageTemplateService when we invoke its Value property, which we only do in the OnDisplaying method. All good! The user is now able to select which parser he wants to use for messaging templates. Next, we will see how we can implement settings on a per content type/part level, so that the user can override this Default Parser setting on a per content type level. Content Type/Part scope settings are settings stored on a per content type/part level basis. This will allow the user to create ultiple template types, and choose a different parser engine per type. The key to implementing such settings is to implement a class that derives from ContentDefinitionEditorEventsBase. It is basically a simplified driver specifically designed for content definition editors. We start with overriding the TypePartEditor method, which will deserialize any existing settings for our type/part into a model called MessageTemplatePartSettings (which we will define shortly) and yields a TemplateViewModel using the DefinitionTemplate method. Notice that the base class ContentDefinitionEditorEventsBase contains the word "EditorEvents". Inheriting from this base class enables us to do advanced stuff when the user is editing not only a field, a part, or a type. It also enables us to provide custom UI per Part in the Content editor screen, which we are doing here. This class provides us with granular control over customizing the UI for editing metadata of the content type system. Notice that again we're using the UIHintAttribute using the "ParserPicker" value. Since we already implemented that editor template, it will work without additional work. The second method in the MessageTemplatePartSettingsEvents is the "post back" version. This method is called for all implementations of IContentDefinitionEditorEvents (which ContentDefinitionEditorEventsBase implements), so we need to check for the name of the builder being passed in. If it's not the name of our part, we short circuit. If it is the name of our part, we new up a view model for modelbinding, and if that succeeds, we register a setting with the builder. Finally, we return a TemplateViewModel using the DefinitionTemplate method to render the view. Lastly, we implement the view template for our custom content type/part settings. Very cool. We managed to implement site level settings as well as content type/part level settings. We will put these settings to good use when we complete the implementation of the MessageTemplateService in the next part. 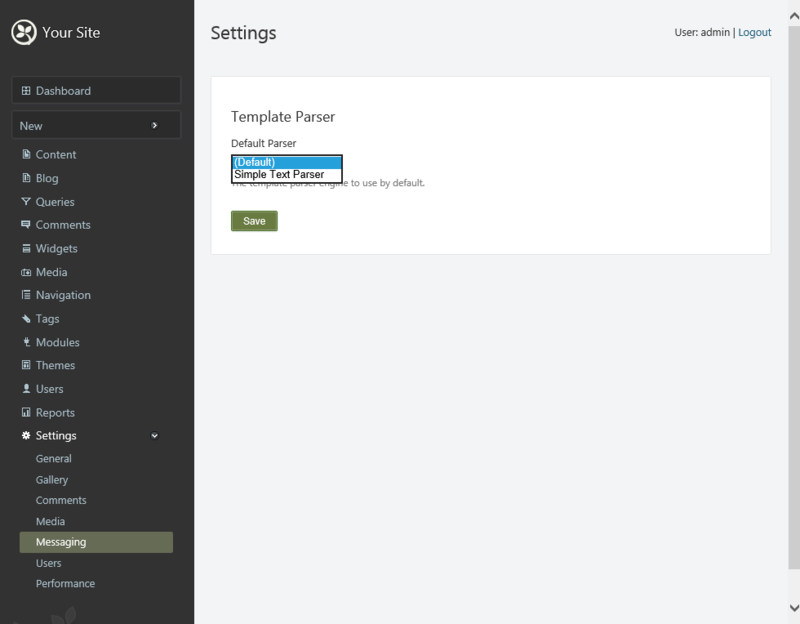 But before we end this part, let's enhance the Template editor with CodeMirror and implement a preview pane. To turn a textarea into a code editor, all we have to do is include codemirror.js, the required files for the syntax/mode that we want to use, and invoke the CodeMirror.fromTextArea() method which takes a TextArea DOM element as well as an options object. Now it's time to update the MessageTemplate.cshtml editor template in Views/EditorTemplates/Parts. We'll surround the textarea currently used to render the template text value with a <div> element so that we can apply a little styling to the code editor. We'll update the TemplateEditor.less file in a moment, for now let's focus on including the required CodeMirror stylesheets and scripts. Notice that because CodeMirrors comes with its own CSS files that are not stored in the conventional Styles folder, we have to include the full path. Basically, this script defines a function called initializeEditor which is invoked on page load. The function searches for the texarea we designated as the template editor and invoke CodeMirror.fromTextArea passing in the textare as the argument, along with some options. Now, we talked a little about the Master Layout feature, where one template could have another template as its Layout. Wouldn't it be nice if we could actually have a preview pane that renders a preview of the HTML, taking into account the selected Layout? Of course it would! First of all, we'll add the required markup to the MessageTemplate.cshtml view. The majority of the added code has replaced the initial markup of the <div class="codemirror"> element (which is still there, it's just wrapped with some html to neatly lay it out next to a preview pane). The Preview pane is implemented as an iframe, which will load the HTML defined in our codemirror textarea. Notice that we are now actually using the ExpectedParser property of the Model. We need to set this property from our driver, which we'll update in a minute. And not only that, we want to wrap the HTML inside of the selected Layout, if any has been selected. // Loads the HTML of the currently selected layout. // See if we have a cached version of the layout's content. // Load the template text of the selected layout. // When the promised data is available, store it in the dictionary for future lookups. // Return a promise that will resolve immediately. // Updates the preview iframe, taking into account any selected layout. // When the layoutcontent is available, process it. // Processing the layout is a simple matter of replacing the layoutBeacon with the content of the current template being edited. // Write the final template to the iframe. The first function, getLayoutContent, loads the template text of the selected Layout. Notice that it implements a caching mechanism using a lookup dictionary. This prevents loading the layout using AJAX on each keypress. Notice that it uses the url fetched from a data attribute. This attribute will be added to the markup in the TemplateLayoutPicker.cshtml view shortly, after we implement the controller that handles the request. The second function, updatePreview, is responsible for updating the iframe after it processes the selected layout, if any. And this is the second time where the LayoutBeacon comes into play: it's a simple mechanism that replaces the beacon value in the layout template with the template text that the user is currently editing. The last function we already know, but it has been extended to add 2 event handlers: one for the change event of the textarea, and another one for the change event of the layout picker select list. Both events will trigger a call to update the preview pane. It's a simple controller that exposes an action called LayoutContent accepting the ID of a template. If the template is in fact a Layout, it returns its text. Simple as that. It dynamically updates the href attribute of the "Edit Layout" link when the user changes the selected layout. Finally, let's update the MessageTemplatePartDriver to set the ExpectedParser property. This will hint the user as to what syntax to use for the template. 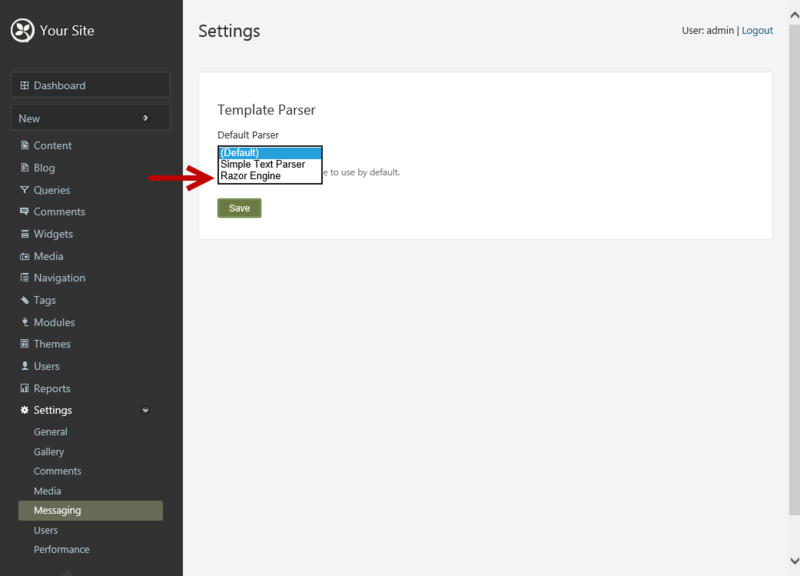 // The editor will render a dropdown list of available templates that are marked as Layout. // The following call will return all content items with a MessageTemplatePart where IsLayout == true. // We are also filtering out the current content item ID, because we cannot allow the user to set the layout of a template to itself. // Set the expected parser based on the template part so that the user knows what syntax is expected. // Get the parser ID configured on the content type/part level. // If a parser ID was specified, try and select that parser. // If we didn't find a parser, try and select the parser configured on the site scope level. // If we still found no parser, return the first one. /// Returns the parser ID configured on the content type/part level. We're using the GetModel<T> method that internally model binds the Settings dictionary to whatever we specify as T. Quite neat if you ask me! Returning back to the SelectParser method, we will try and find a parser with the returned ID. If no parser could be found, we use our site scoped settings part to get the configured parser, if any. If no default parser was configured there either, we'll fall back on the first parser we find. There will always be at least one parser, since the two parsers we implemented are bound to the same feature that this service is bound to. Let's see how things are working out. 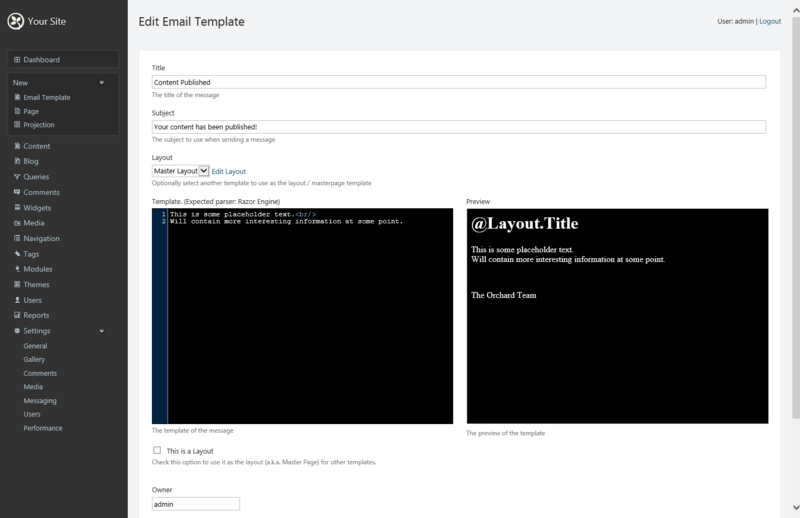 To demonstrate the Layout feature, let's create another Email Template that will use our Master template as its Layout. As you can see, te selected layout is neatly applied to the template being edited. In this part, we implemented two Template Parsers, demonstrated how to implement site-wide settings as well as content type/part scoped settings and how to use these settings. 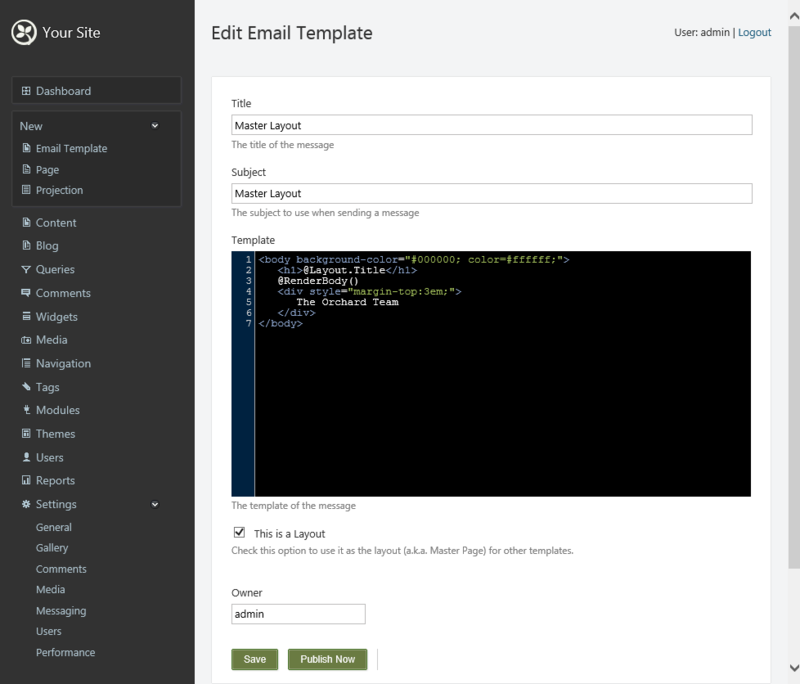 We enhanced the template editor with CodeMirror and implemented a preview pane. In the next part of this series, we will finally see how to leverage these templates and parsers, when we have a look at creating a Rule, implementing a custom Action, and integrate Tokens for use with the Subject field as well as exposing information to the template parsers. Download the source code: Skywalker.Messaging.Part2.zip. "What would be really interesting is if we could create our email templates with Razor syntax"
Take a look at Postal (https://github.com/andrewdavey/postal) We've used it in a few projects and it works nicely. Thanks! Looking forward for next part. When I set 'Razor' as the default parser, create a template, it works fine. If I then go and change the default parser to 'simple text parser', save, then select 'New -> Email template', it still shows 'Expected Parser: Razor Engine'. ?? That's a bug, will be fixed in the next part. Thanks for reporting! I have one question: can I use nuget to get the dependencies instead of downloading the binary? I've used nuget to download RazorMachine (CodeMirror on nuget is only available in an older version or in a weirdly splitted newer version). does something speek against it? If the Orchard module manager downloads the dependencies from nuget when installing a module this would be nice (have to give it a try if this actually works). One reason why I prefer the nuget approach is that the binaries don't need to be included in the version control and are restored by the nuget package manager (I can restrict the allowed version in the packages.config file if I want to support a specific version of an assembly).